Christof Lehmann (nsnbc) : The green light for the use of ISIS brigades to carve up Iraq, widen the Syria conflict into a greater Middle East war and to throw Iran off-balance was given behind closed doors at the Atlantic Council meeting in Turkey, in November 2013, told a source close to Saudi – Lebanese billionaire Saad Hariri, adding that the U.S. Embassy in Ankara is the operation’s headquarter. A “trusted source” close to the Saudi – Lebanese multi-billionaire and former Lebanese P.M. Saad Hariri told on condition of anonymity, that the final green light for the war on Iraq with ISIS or ISIL brigades was given behind closed doors, at the sidelines of the Atlantic Council’s Energy Summit in Istanbul, Turkey, on November 22 – 23, 2013. The summit was, among others, attended by Turkey’s President Abdullah Gül, U.S. Energy Secretary Ernst Monitz, Atlantic Council President Frederick Kempe, former U.S. Secretary of State Madeleine Albright, former U.S. National Security Adviser Brent Scowcroft. It is noteworthy that Scowcroft has long-standing ties to Henry Kissinger and to the Minister of Natural Resources of the Kurdish Administrated Region of Northern Iraq. “Had Baghdad been more cooperative about the Syrian oil fields at Deir-Ez-Zor in early 2013 and about autonomy for the North [Iraq’s northern, predominantly Kurdish region] they would possibly not have turned against al-Maliki; Or he would have been given more time”, said the Hariri insider during the almost two-hour-long conversation. 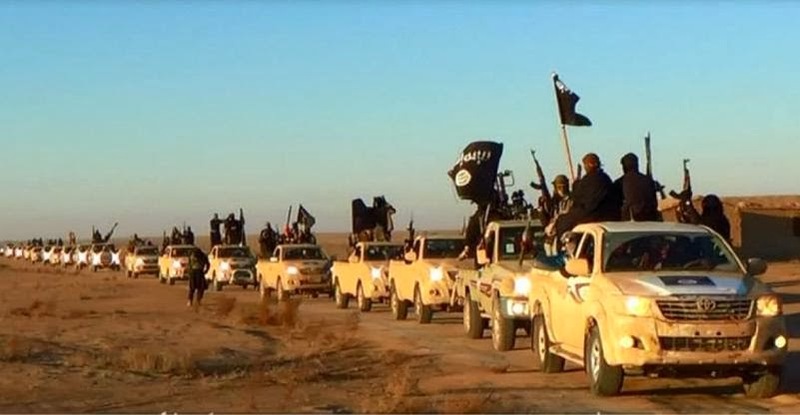 In March 2013, U.S. Secretary of State John Kerry demanded that Iraq “stops the arms flow to Syria”, while U.S. weapons were flowing to ISIS via Saudi Arabia into Iraq and Jordan. On Monday, April 22, 2013, 27 of the 28 E.U. foreign ministers agreed to lift the ban on the import of Syrian oil from opposition-held territories to allow the “opposition” to finance part of its campaign. “ISIS that was supposed to control [the region around] Deir Ez-Zor. [Turkish Energy Minister Taner] Yildiz and [Kurdish] Energy Minister Ashti] Hawrami were to make sure the oil could flow via the Kirkuk – Ceyhan [pipeline];… Ankara put al-Maliki under a lot of pressure about the Kurdish autonomy and oil, too much pressure, too early, if you’d ask me”, the source said. He added that the pressure backfired. “That is right, but the heavy increase in attacks came in May – June 2013, after al-Maliki ordered the military to al-Anbar “. 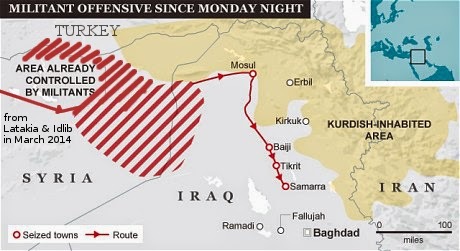 A previous article in nsnbc explains how Baghdad’s blockade caused problems in Jordan, because many of the transports of weapons, fighters and munitions had to be rerouted via Jordan. The Hariri insider added that the oil fields should have been under ISIS control by August 2013, but that the plan failed for two reasons. The UK withdrew its support for the bombing of Syria. That in turn enabled the Syrian army to dislodge both ISIS and Jabhat al-Nusrah from Deir Ez-Zor in August. “The situation was a disaster because in June Hariri, Yidiz, Hawrami, Scowcroft, and everybody was ready to talk about how to share the oil between the U.S., Turkey and E.U.. The Summit in November should have dealt with a fait accompli”, the Hariri source stressed, adding that Washington put a gun to al-Maliki’s head when he was invited to the White House. Both the President of the Kurdish region of Iraq, Masoud Barzani and Iraqi PM Nouri al-Maliki were invited to Washington in early November 2013. “Who exactly pressured Obama? I don’t know who delivered the message to Obama. I suspect Kerry had a word. It’s more important from where the message came, Kissinger, Scowcroft, Nuland and the Keagan clan, Stavridis, Petreaus, Riccardione, and the neo-con crowd at the [Atlantic] Council. 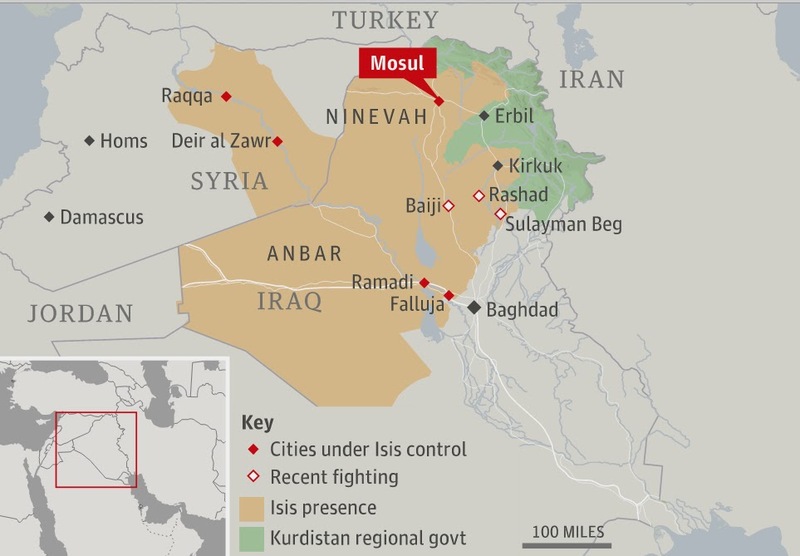 … As far as I know ´someone` told Obama that he’d better pressure al-Maliki to go along with Kurdish autonomy by November or else. Who exactly ´advised` Obama is not as important as the fact that those people let him know that they would go ahead, with, or without him”. ” Behind closed doors, in the presence of both Scowcroft, Hariri, and a couple of other people”. To my question “if he could be more specific” he replied “I could; I want to stay alive you know; Riccardione was tasked with the operation that day”. Noting that a prominent member of Saudi Arabia’s royal family, Prince Abdul Rachman al-Faisal has been named as the one being “in command” of the ISIS brigades, and if he could either confirm or deny, he nodded, adding that “the Prince” is responsible for financing the operation and for part of the command structure, but that the operations headquarter is the U.S. Embassy in Ankara Turkey. “As far as I know, nothing moves without Ambassador Riccardione”, he added. 15.13 General David Petraeus has answered the question “after America, what?” with a robust defence of America, or “North America” as it’s traditionally known. He said the “highly integrated” forces of Canada, the United States and Mexico would provide the world’s next powerhouse for energy production and scientific advancement. There are four revolutions that are ongoing at various level in each of the countries but foremost in the United States. The energy revolution is the first of those, which has created the biggest change in geopolitics since the rise of China since 1978. He explained that the remaining industrial revolutions in IT, manufacturing and life sciences, “as highly integrated as they are, allow you to argue that after America comes North America”. Yesterday Sen. Rand Paul spoke on a conference call organized by Michael Bloomberg‘s Partnership for a New American Economy and – together with Grover Norquist – promoted comprehensive immigration reform (what most call “amnesty”). Now, either because he got pushback or to take the sales job to his Tea Parties base, Paul offers a guest editorial at Breitbart News ( peekURL.com/z96LtY3 ). I’ll briefly describe how it’s wrong and how he’s attempting to deceive you. If you’re a Rand Paul supporter, I hope to change your mind. I am for immigration reform because I am against allowing 12 million more illegal immigrants into our country. If we do nothing, 12 million more illegal immigrants will come. We must be in favor of reform—smart reform that starts with border security. Characterizing that position as “amnesty” is simply untrue. What we have now is a lawless border. Current policy is a beacon for more illegal immigrants. The Obama administration’s lawless executive orders legalizing people who came here illegally will only encourage more illegal immigration – unless we act now with real, strong, verifiable border security. I am for immigration reform because what we have now is untenable. I voted against the Gang of Eight’s comprehensive immigration reform bill because it did not secure the border first. I will only support reform that has border security first as verifiable and ascertained by Congress, not the president. My plan will not give the president the authority to simply declare that the border is secure. It will require yearly votes of Congress to ensure the president doesn’t get around the law. My “Trust but Verify” plan will ensure that our border is secure. Under my plan, national security and border security will move as the first element of any reform and would require annual votes of Congress to establish that the border is truly secure. No other reform could go forward until this happened. 1. The first paragraph is the “we already have defacto amnesty” line popularized by Marco Rubio. Paul’s talking point is deceptive because it assumes we must choose between the current situation and some form of mass legalization. There are other options that Paul is ignoring, such as attrition. If Paul and his colleagues really wanted Obama to enforce immigration laws, they could make it happen. To some extent, Paul’s first paragraph is an extortionist’s threat: give me what I want or things will get worse. 2. For various reasons, the mass legalization Rand Paul wants would encourage more illegal immigration. It would give more power to far-left groups that currently support illegal immigration, such as the American Civil Liberties Union. Paul’s plan wouldn’t punish employers that knowingly hired illegal aliens in the past, it would let them off the hook and encourage them to keep hiring illegal aliens if they can. And, as can be seen currently, weakness on immigration – such as talk of mass legalization – can lead to a mad rush for the borders. Rand Paul’s plan would also reward political corruption, such as those politicians who’ve looked the other way on illegal immigration because of large donations from business groups. Rand Paul’s plan would reward such behavior and encourage more of it. 3. In the second paragraph, Rand Paul plays word games. His plan is what most people would refer to as “amnesty”. But, to avoid confusion, let’s play his game. Let’s not use the shorter “amnesty” but the longer “mass legalization”. Instead of arguing with Rand Paul whether his plan is amnesty or not, let’s just show how his plan will harm the U.S. See reform not amnesty for more on that aspect. 4. There is one group for whom Rand Paul’s plan – and all other immigration “reform” plans so far proposed – are definitively amnesty. As alluded to above, all those businesses that knowingly or not hired illegal aliens will get off the hook. Illegal aliens will be forced to pay some kind of fines (unless those are waived) and will face other “tough” punishment. But, their employers will get a full and complete amnesty for their past hiring of those illegal aliens. In some or many cases those employers knew what was going on but looked the other way, or knowingly accepted fake documents. They won’t face any sort of punishment for that. 5. Rand Paul is in the “secure the border first” crowd: as discussed at the link you have to ask what comes second. In Rand Paul’s case we know: mass legalization of millions of illegal aliens. 6. Whether putting Obama or Congress in charge of declaring the border secure, that’s letting the fox guard the henhouse. Obama, George W Bush, Bill Clinton, Ronald Reagan and previous Congresses brought us to the current situation. Rand Paul certainly isn’t doing all he could to secure the border right now, nor are most other leading politicians. Some of those politicians might be marginally better than Obama on immigration, but generally speaking trusting leading politicians – Democrats or Republicans – on immigration isn’t a wise idea because they’ve shown themselves to be quite corruptible (generally either by racial power in the case of the Democrats or business donations in the case of Republicans). 7. Why is Rand Paul holding “national security and border security” hostage to his mass legalization plan? If he were truly concerned about the security of the U.S., wouldn’t he at least push that separately? Yet, Rand Paul is tying them together: demanding mass legalization as a precondition to securing the border. My plan takes border security a step further than anybody else in Congress. Under my plan, Congress will vote every year on border security. If Congress votes that the border is not secure, elements of immigration reform will cease to go forward and visa programs will be slowed. If Congress does not think the border is secure after five years, every element of immigration reform will be stopped. 8. See #6 above. Congresses come and go, some will be better on immigration than others. The very people who’ve shown themselves to be corruptible on immigration will be the ones voting on whether to continue aspects of Rand Paul’s plan. His plan will give more power to the people and groups that currently try to undercut border security: the ACLU, the National Council of La Raza, and hundreds more. They’ll use that increased power to make sure that, for instance, politicians weaken some aspects of Rand Paul’s plan to allow certain programs to continue (like DACA) even if the border isn’t judged secure. Rand Paul’s last sentence above is cruelly deceptive: he knows that once his plan is started it’s not going to be stopped. The forces that would oppose stopping it or halting parts of it are too strong and have too much money. Our nation is a nation of immigrants. Throughout history, our nation has been flooded with immigrants who have moved here with a flavor for the home country, yet they have assimilated into what we know today as America. That idea, and the American Dream, must be protected and preserved. Immigrants are drawn to the magnet of free market capitalism here in the United States. Our nation should have open arms to immigrants who want to come her and work hard to make a new life in a free nation. As a libertarian-minded senator, I am attracted to the idea of somebody coming to this country with a couple dollars in his pocket, and then through hard work, make the American Dream a reality. 9. See nation of immigrants and immigration tradition fallacy for a discussion of the hoary talking points uses in the first paragraph above. 10. The people and groups that Rand Paul’s plan will give power to tend to oppose assimilation, such as the NCLR. There is little current external pressure on immigrants to assimilate. Those who try to assimilate immigrants tend to get smeared by the far-left and tend to back down. Rand Paul’s plan would make that worse. 11. The U.S. is a lot more than just the shopping mall/flea market Rand Paul envisions. Some immigrants have opinions on various topics that simply aren’t compatible with fundamental American concepts. We can’t have people coming here just because they want to make money: that’s not what the U.S. is all about. I do not support amnesty, which is why I don’t support our current system with no border security and a blind eye to the problem. I support legal, not illegal, immigration. We must embrace immigration and immigrants, and we must recognize that our country has been enriched by those who seek the freedom to make better lives for themselves. However, our current system is broken, and we cannot move towards reform until our border is truly and fully secure. Rand Paul is still playing word games, still using bogus talking points (system is broken), and still holding border security hostage to his mass legalization plan. He’s also not putting numbers on the (no doubt high) legal immigration he wants. We could move forward on border security right now. Rand Paul could go on a crusade demanding that Obama enforce immigration laws at the border and at the workplace. Rand Paul could speak out against the various actions Eric Holder and other administration officials have taken to encourage more illegal immigration. Instead, Rand Paul is holding all that hostage to a massive legalization plan that would have massive negative impacts on the U.S. If you were and still are a Rand Paul supporter, I want to change your mind. Contact me at @24AheadDotCom. If, on the other hand, you realize how deceptive Rand Paul is and want to oppose his plans, then make the arguments on this page to those who haven’t seen the light. That could take you as little as a few minutes: search Twitter for those who tweet approvingly to @SenRandPaul, and then make the points on this page to them. If Thursday’s news reports are accurate, hysterical fear of “terrorism” has just reached a new low. Two dozen middle schoolers were suspended because they commented on or shared a Facebook post urging mass resistance to their school’s dress code. This is the kind of small act of resistance adolescents have indulged in forever — particularly in the heady last week before summer vacation. I’ll wait a moment while your eyeballs stop rolling. But the situation is really, really, really unfunny when you consider how the growing misuse of the concept of “terrorism” is damaging both the future of freedom and the future of one of freedom’s essential protectors, the right to own and use firearms. 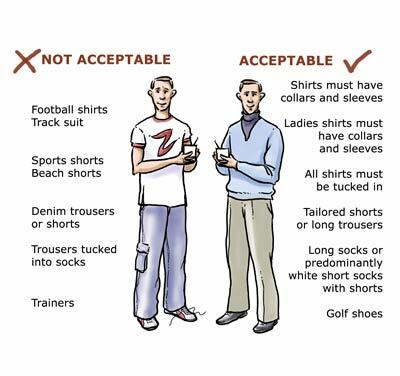 I’ve never heard of anybody violently threatening to wear an outfit, have you? Even with rising fear of kids wearing gang colors or pro-gun tee-shirts, it’s hard to imagine how someone could “violently” wear a skirt or pair of pants. 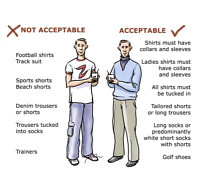 So never mind said school official’s alleged “terror” of defiantly dressed 12 year olds. 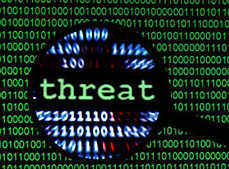 Even a genuinely violent person shouldn’t be called a terrorist or be said to make “terroristic threats” unless he or she is using or threatening violence against innocents with ideological goals in mind. But (you may be saying) why should we care if a word is being misused? We live in an age when terrorism — no matter what you call it — is a geniune threat; quit being petty about definitions, Claire! If you’re saying that, I’ll refer you to Mr. Orwell for discussion on the importance of the meaning of words and the perils of their political abuse. But if you’re wondering something more along the lines of, “What does all this have to do with guns and gun-rights?” … follow me. 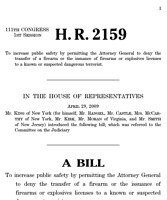 Denying Firearms and Explosives to Dangerous Terrorists Act of 2013 – Amends the federal criminal code to authorize the Attorney General to deny the transfer of a firearm or the issuance of a firearms or explosives license or permit (or revoke such license or permit) if the Attorney General: (1) determines that the transferee is known (or appropriately suspected) to be engaged in terrorism or has provided material support or resources for terrorism; and (2) has a reasonable belief that the transferee may use a firearm in connection with terrorism. Allows any individual whose firearms or explosives license application has been denied to bring legal action to challenge the denial. Lucky you, though, you’d still have the right to sue after being denied your other constitutional rights. Maybe after five or six years, half a million dollars in legal expenses, and constant denials of needed information in the name of “national security” you might even win. Fortunately, so far, this “terroristic threat” of a bill has never made it out of committee. At the same time, it’s not just one of those little “hobby horse” bills that certain lone legislators submit over and over and over again without either hope or co-sponsors. Given the right moment — the most handy crisis — this one could eventually pick up and go somewhere. And that would be a very bad thing. 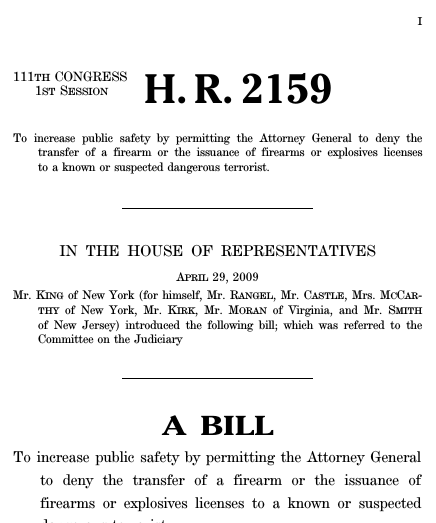 The bill’s authors have never explained the difference between a “dangerous terrorist” and a harmless terrorist. Perhaps it’s the sort of tee shirts they wear. (Dangerous terrorists in red? Harmless terrorists in blue? It’s quite the mystery.) But the authors and co-sponsors are the heavyweights of authoritarian anti-gunnery. They include: Dianne Feinstein and Charles Schumer (of course) and Sens. Boxer, Gillibrand, Levin, and other usual suspects in the Senate. Signing on to this bill was one of the last legislative acts of Frank Lautenberg before his misspent (but very long and powerful) life ended. In the House, sponsors have included: Charles Rangel, Peter King, Henry Waxman, and others of their ilk. But okay, maybe this bill will never, ever become law. We can hope. Still, it represents and reflects the very same trend that’s going on at Cowen Road Middle School — crying “terrorism” to justify every overreaction of authority. 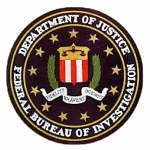 Not only is the language changing (through political manipulation), but so is the legal landscape of the U.S.
Don’t forget that, according to the FBI businesses should already report you as a suspected “domestic terrorist” if you do such innocuous things as pay with cash, buy MREs, get the same tattoo your friends have, talk about your constitutionally protected rights, or even park in the “wrong” parking space at a hotel or motel. The Obama administration even cried “terrorism” to cover up a nasty paperwork error. “Terrorism.” It’s so handy! So convenient! Don’t think for one minute that this administration — or any other in the future — would hesitate to call all gun owners “terrorists” if it suited their political purposes. Don’t think power-seeking authoritarians would hesitate to declare gun ownership itself a “terroristic threat.” Maybe not this year or next. But when the word “terrorist” can be applied to anyone who challenges power, and that person so labeled can be punished accordingly — then eventually powerful people will use that “wonderful” control tool to fulfill their rapacious aims. They haven’t succeeded yet, but already there are people in Congress who want to hand exactly that power over to unelected, secretive, gun-hating bureaucrats.